Moving is not something that most people enjoy. Aside from leaving behind friends, and special places you enjoy visiting, you’re going to a new place where everything is among the unknown. What makes moving even more stressful is the cost of the move. On the surface it seems doable but, once you start factoring all the additional fees on both ends, it can add up quickly to an alarming amount. Luckily, there are ways to reduce the cost of your move to free up cash you can use when you arrive at your new destination for a few new things. Unfortunately, moving companies are not all alike. Some can run thousands more than another. For this reason, it’s important to do a thorough search and select a few companies either referred by family and friends or that have high marks from prior customers on their reviews like North American Van Lines. Another thing to keep in mind is that if the move is something you have control over, pick a date during the off-season. This period generally runs from late September through early April. If you don’t have that luxury you can still save a few dollars by planning your move for the middle of the month on a Monday through Thursday when the demand is the lowest. Moving does have an upside. If you have acquired many possessions over the years and just haven’t had the time to declutter now is the time. There are several very good reasons for doing so. First, it will cost you less money if you occupy less space on a truck. Unfortunately, everything you bring whether in a box or a piece of furniture carries a price tag. So, if anything is on the maybe list, its best to part with it, especially if you find it tucked away in your attic. Secondly, if the items you no longer want or need are in good condition there are so many ways to sell them. You can host a garage sale, on an account online or list them in the local free papers and put the money you make towards some of the expenses. The things that you can’t sell you can either give away to family or friends or donate them to your local church or a favorite charity. If having someone box up your personal items doesn’t sit well with you then pack up your supplies on your own. Moving companies charge an additional fee for having to do the work themselves. If you opt to do it you’ll save money and keep your privacy. You can take it a step further and avoid the expense of having to purchase boxes by planning ahead and contacting your local supermarket or retail outlet and inquiring about getting some. In most cases, they will be happy to unload them. Just check ahead of time as to their delivery dates to get the first pick. Another thing to keep in mind is that when you receive your quote the final number includes a certain amount of boxes in particular sizes. Check the amount and the sizes you agreed to so that you don’t end up paying more. Moving means that the place you occupy now needs a good cleaning. A great way to do it for cheap is to buy the supplies and then invite family and friends over for a going away slash cleaning party. For all their efforts, you cook and provide the refreshments. This way your home is spotless and your family and friends get a chance to say their goodbyes. The cost of moving is a two-way street. There are fees here and then there are fees there. In order to avoid paying more than you should at your new home, it’s important to shop around for the services you can. Cable or satellite providers vary in prices and plans. Some also include internet and phone services as well. If you are not certain of the companies in the area you are moving to, contact the realtor. They generally know most if not all of the local companies and which ones offer the best service and rates. This way you’ll know that you got the best deal. Moving is never easy and most times quite expensive. 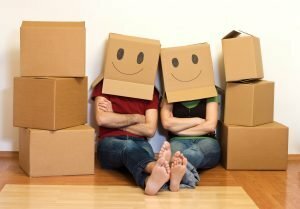 Luckily, there are many ways to reduce the total cost of the move so that you can have a few dollars in reserve to purchase something new for your new place.